You are here: Home / Christian Talk / Your Pastor is Not God. (ThyBlackMan.com) There is plenty of confusion within Christianity among denominations and communities. In the black community church attendance for young adults is not the best. Many are looking at the church as a cesspool of drama that take more than it gives. 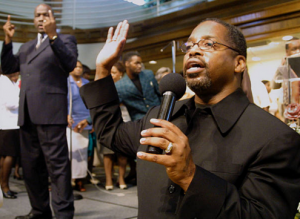 Pastors have been under scrutiny for everything from mishandling funds to terrible political alliances. In churches that have strong sound leadership members unfortunately watch their pastors work under the continued pressure of a very unrealistic expectation. This expectation may have something to do with why some pastors are able to become so powerful. It is one thing to acknowledge, honor and respect the head of one’s church. It is understandable that one would expect them to have a strong sound understanding of God’s Word and offer sound council. However, too many pastors have become idols on earth. Pastors can do many different things to help direct their congregation and have a positive impact on the community…but they are NOT God. The pastor can’t heal your body, fix your marriage, get you out of debt, silence your haters, change your children, nor calm your anxiety. In ignorance, too many people expect the pastor to be the end all be all and in doing this they are given power over your life that does not belong to them. At the hands of corrupt leaders’ congregations have been tore apart, marriages and families have been destroyed, and even with all the unholy behavior revealed there are still those members that will defend the foolishness to no end. Because you would see the pastor as someone set on high it’s easy to remove him from the level of accountability his office requires. When you take the time to study your bible for yourself its easier to understand the role a pastor has in your life, and that role does not sit above you nor your family. In this same mindset good pastors can be ran into the ground. You don’t understand why the pastor is not ministering this Sunday. Did it ever occur to you that maybe he needs to rest? He is human and cannot fix everything. He can’t be a strong leader for the congregation if he can’t take care of himself. If the president of he Unites States knows how to take a vacation what makes you think your pastor doesn’t need one. This is where believers, again, need to understand the Word for themselves. Know that, though the power of agreement is available, its okay to keep yourself lifted in prayer. If the pastor can’t make it to the hospital to see you because he, or a member of his family, is ill this doesn’t make him a terrible leader. The best example he can give you is himself. It should comfort you that the person leading your church understands self-care, makes his family his first priority, actually spends time seeking God for himself, and gives to the same ministry you do while holding himself to the same principles as you. In this he is showing you is a Man of God…he is not God. Take a moment to evaluate how you view church leadership. Look at what you defend, or rebuke, and match it against the Word you profess to believe. Understand your pastor is a part of your community and your church support system, but he didn’t give you life. He will answer to the same God as you. Brother you don’t even like to be called black when all the great leaders: Malcom X, MLK, Fred Hampton CALLED THEMSELVES JUST THAT. You sound like Umar Johnson, the nerve to criticize Frederick Douglas over a white wife. You..(Ya’ll) haven’t done anything to the community compared to them, therefore your rhetoric is garbage. Put in that work and I’ll believe you, until then…. West Africans Historical DNA comes from…….Congo AKA Central Africa AKA also East Africa…AKA BLACK. THE ORIGIN IS THE MOST IMPORTANT OF ALL….YOU ARE A BLACK MAN! I’m secure who I am..I’m not reciting from.. or fighting some White Supremacist View of who I am. Like Klaw in Black Panther he called them savages even when wakandans were clearly the better people. Brown is the color of turds in the toilet. Black is the color of a business doing fine. Why is it so important what we call ourselves? We have no Tribal Name or Culture so any “meaning” is pointless and based on emotional/dictionary fiat. Its meaning isn’t worth anything. *Africa also comes from Egypt…but we are not Kemet, nor Moors. You always pick the most irrelevant of topics.